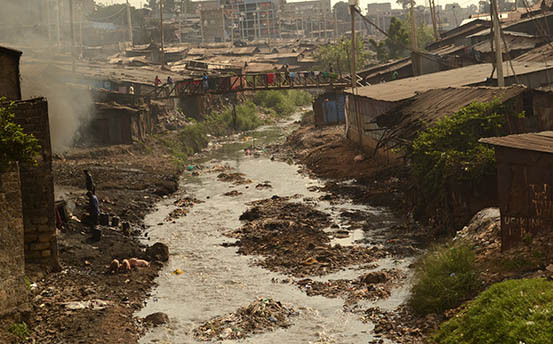 An overview of Mathare River. Every kind of litter, finds its way into these water bodies destroying the aquatic life and the purity of water. Water is key for survival therefore we should strive to ensure we utilize it as appropriately as possible. However this isn’t the case since many people are ignorant such that they end up destroying the water sources eg. Rivers, lakes and seas. A good example is Kenya which has water shortage currently such that it is affecting not only those in the remote areas but also those living in the major cities. In this situation, water becomes very costly thus reducing the living standard of people mainly those in the slum. Young people fetching water in Mathare slum. ​Two boys carrying water on their shoulders in Mabatini, Mathare slums. Water shortage in the slums force young people to fetch it more frequently. An average German takes 4 liters of water to spray his garden.If you spray your garden with tap water, it is a waste of water because in Germany it rains often enough. The rainwater have the same effect as tap water, but it is saver and cheaper than tap water. In Germany the average water consumption is 120l per day. But they use only 3l per day for drinking. Water is life. Humans needs water. The whole world in bottles. Water in small bottles.Water in big bottles. Sparkling water and water in glass or plastic bottles. The water comes from different streams. The most labels are using water from north Germany or Austria but i can also discover bottles filled with water from Finland, Newzeland or Africa. Isn't that strange? I've got the possibility to pay a few cents for water, which traveled Across the whole world. But that water doesn't belong here.It is the world in bottles and i think the world should be free. ​A small boy is carrying a bottle of dirty water at Gitathuru river in Mathare slums. Together in search of water: 3 girls from Mathare slums carrying containers of water. At all cost water can be carried on the head. A young man carries a 10 litre on his head. As a result of water pollution and wastage, water becomes scarce hence leading to drought and water shortage. Water shortage is affecting households in Mathare slums. With this devise you can make sparkling mineral water. In Germany they drink a lot more sparkling mineral water compared to other countries in the world. Germans consume 3,3 billion liters of sparkling water in a year. Every Human have to drink 1,8 liters of water at least on a day. If a people weights a lot he must drink more. The most people drinks to little. The glasses demonstrate how much it is. Water is life, but also water is alive. It's such an important thing to us. I think we often do not appreciate, who much it counts on us. This is a indoor swimming pool which has about 6,3000 members. It is 50 meters long, 20 meters wide, six meters deep and it needs about 6 million litres of water. Children swimming in a local creative swimming pool in Mathare slums. A male duck swims alone in a sea. It`s springtime and his “wife“ is brooding in the grass. Every drop of water is important as people fetch water in Mathare slums along Juja Road. Scarcity of water in Mathare slum where people are force to look for water longer distance using the cart. Some use as business opportunity to sell water. This is an island for ducks. They can protect themselves for rain and storm. This photo show the effect of when almost all water taps run dry and people look for an alternative means which is to store water in gallons but have to queue for long time for his/her turn. This is a green pavilion in a public park, where you can sit and relax. The yellow flowers are planted by a gardener. This park is full of different trees and flowers. Properly piped water helps to keep the water clean and hygiene. This plant grows close by the shore of a small river. She needs a lot of water to get a size of 1,5 meter. Most of the plants in the park get the water from this river. Plants needs water like humans to be alive. Green Sparkling lights and water splashing down on you - like a rainforest in our daily city lives.